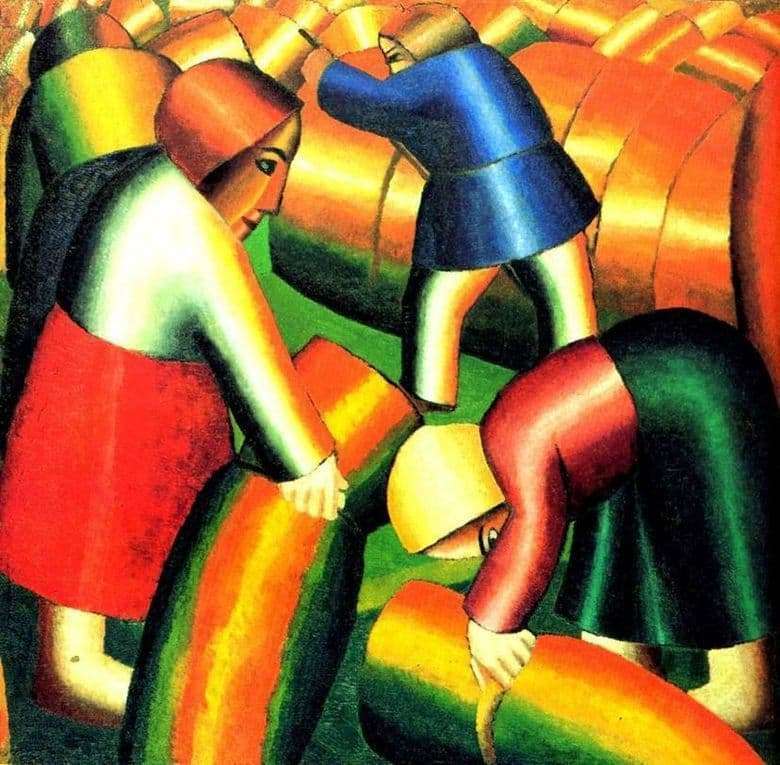 “Rye-harvesting” is an example of Russian cubist-futurism, which originated from the French masters. The work belongs to the peasant series of paintings, depicting the routine lifestyle of rural life. During this period, Malevich had a turning point in the direction of the artistic style. The plot of the picture is quite simple: the peasants are harvesting hay. The figures of people are devoid of complex parts and are purposely depicted enlarged. They seem to consist of bent sheets of iron, hard material casts a metallic sheen in the light. Despite the fact that the bodies are written quite simply and schematically, it is easy to determine where a man and a woman are. Peasants look solid, firmly standing on their feet, one might even say monumental. Their faces retain a calm expression, the features refer us to icon painting, where the canon always depicted big eyes. Writing peasant figures completely devoid of realism and naturalism. Despite this, some dramatic notes are well guessed in the work. People resemble each other, their labor is mechanized, they seem to be detached. This creates a striking contrast with the usual inspired and heroic images of socialist workers, filled with pride and passionate desire to serve the good of the country. “Rye-harvesting” is one of the first pictures that showed signs of cubist-futuristic painting. Haystacks in the form of cylinders and clear forms of human figures make up a rather strong and stable composition. Interestingly, the upper part of the canvas, as if out of control of this rigid scheme. Haystacks are arranged randomly, disrupting order, creating randomness and unbridledness. The look attracts a bright palette that uses complementary color contrast. Energetic combinations of red and green, blue and yellow add some dynamics to frozen forms.